In a recent application that demonstrates trademarks are more than just words, logos, and slogans, Megaphase, LLC, a designer and manufacturer of coaxial cables and connectors, filed an application to register the coaxial cable pattern seen below as a trademark with the U.S. Patent and Trademark Office. But will it get a registration on the Principal Register (which affords the most legal benefits)? 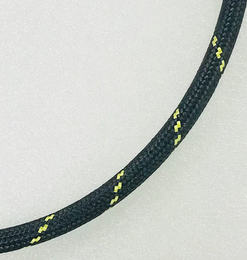 The application, filed on September 5th, describes the trademark as "repeating pairs of yellow dashes applied in a spiral pattern along the length of a coaxial cable." The color yellow is claimed as a feature of the mark. The application covers "coaxial cables" in Class 9 and the mark has been in use since May 31, 2015 (according to the application). Repeating patterns marks can function as trademarks. TMEP 1202.19 ("Repeating-pattern marks are often applied to clothing and fashion accessories, but they also appear on other goods, including furniture, bedding, dinnerware, luggage, paper products, and cleaning implements. In addition, these marks frequently appear on packaging for a variety of goods and have been registered for use in connection with services such as retail stores and travel agencies."). In fact, the USPTO's Trademark Manual of Examining Procedure has an entire section devoted to examples of various repeating pattern marks. TMEP 1202.19(k). Whether consumers are used to seeing repeating patterns on the type of product, such that they either view them as ornamental/decorative features or as trademarks (for example, repeating patterns are commonly used on items like clothing, furniture, and pillows, so it would be difficult to argue a pattern is functioning as a trademark when used on those goods) (TMEP 1202.19(e)(i)(E)). If a repeating pattern mark is inherently distinctive, the USPTO will register it on the Principal Register. However, if the repeating pattern is more common, basic, and/or decorative, the USPTO will refuse to register it as a trademark. If the pattern is capable of functioning as a trademark after obtaining acquired distinctiveness in the marketplace, the USPTO may register it on the Supplemental Register. According to my quick search, MegaPhase does not own any U.S. trademark registrations for a coaxial cable pattern. However, it did obtain a registration back in 2010 for "the color red-orange, Pantone warm red C, as applied to the entirety of the surface and length of a cable." However, that registration is on the Supplemental Register because color marks can never be inherently distinctive (see TMEP 1202.05(a)) and MegaPhase did not attempt to argue that its use of this color on coaxial cables had acquired distinctiveness such that registration on the Principal Register was proper.